Document cadastral du début de l’époque normande en Angleterre, le Domesday Book - ou simplement le Domesday - fut dressé sur ordre de Guillaume le Conquérant. 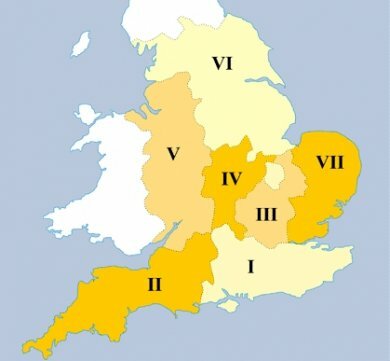 Devenu roi d’Angleterre après la défaite d’Harold à Hastings (1066), Guillaume voulut connaître, de façon précise, les biens et ressources du pays. La description fut terminée en 1086 ; elle devait servir de base à l’établissement de l’impôt royal. La réunion des Sages qui avait eu lieu à cet effet avait recommandé d’envoyer des commissaires (legati ) dans chacun des comtés du pays, avec ordre de fixer, avec le montant de leurs biens et revenus, le nombre de propriétaires nobles, d’hommes d’Église, de villageois, d’esclaves qui s’y trouvaient. L’enquête se fit en prenant pour base le Hundred anglais (on appelle ainsi une division du comté, d’un type analogue au huntari des Goths), d’après le témoignage de douze jurés, six Anglais et six Normands. Le document original consiste en deux volumes qui furent publiés par le gouvernement en 1783. 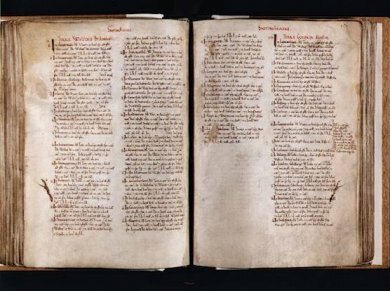 Le Domesday Book est un document de premier ordre pour connaître l’état de l’Angleterre au début de l’époque normande. L’Angleterre y apparaît comme un pays de 2 millions d’habitants environ, dont la grande majorité cultive des terres libres de toute servitude seigneuriale. La plus grande partie du pays est couverte de "forêts", par quoi il faut entendre non seulement les forêts, mais aussi les marécages et les landes ou friches non propices à l’agriculture. L’élevage des moutons et des porcs et, ici et là, la culture des céréales constituent les principales ressources du pays..et des terres dévolues aux Pierrepont. Eadric, a free man, held Wrentham TRE with 2 carucates of land as a manor. Then as now 5 villans. Then as now 11 bordars. Then 6 slaves now 3. Then 1½ ploughs in demesne, now 2. Then 3 ploughs belonging to the men, now 2. Then as now woodland for 20 pigs. Then as now 2 acres of meadow. Now 2 horses. Now 13 head of cattle. Now 12 pigs. Now 113 sheep. Now 20 goats and 5 beehives. And 1 church with 40 acres. Then as now worth 40s. And Robert de Pierrepoint holds this. In the same vill Thorkil, a free man held TRE 2 carucates of land, then as now, as a manor. Then as now 5 villans and then as now 11 bordars. 2 ploughs could be made up in the demesne. And [there was] 1 when acquired it. 2 acres of meadow. Woodland for 20 pigs. Then as now 40s. R[obert] himself holds this land. In the same vill Wulfric, a free man, held 2 carucates of land as a manor. Then as now 5 villans and 11 bordars. 1 plough in demesne and another could be made up. 2 ploughs belonging to the men. 2 acres of meadow. Woodland for 20 pigs. Then as now worth 40s. And 1 church with 20 acres. The same Robert holds this. In the same vill 20 free men dwelt with 360 acres. 2 bordars. Then as now 6 ploughs in demesne. Then as now worth 60s. Over 1 of these men Count Alan has half commendation and half the land and the soke and the sake. Robert holds all this from William de Warenne. The soke and the sake over all this land belongs in Blythburg Hundred. Also William has in the same vill 1 manor which Halfdan, a free man, held. Then 6 villans and now 4. Then 11 bordars, now 13. Then 3 slaves, now 1. Then as now 3 ploughs in demesne. Then and now 2 ploughs belonging to the men. 2 acres of meadow. Woodland for 40 pigs. Now 7 head of cattle. Now 24 pigs. 80 sheep. Now 30 goats. TRE it was worth £4, now £3. William FitzReginald holds this from William de Warenne. In the same vill [...] 1 free man dwelt and held half a carucate of land as a manor. Under him he had 2 free men with 10 acres. 1 bordar. Then as now 1 plough in demesne and half a plough belonging to the men. Woodland for 4 pigs. And half an acre of meadow. 2 horses, 6 head of cattle, 10 pigs, 30 sheep, 20 goats. Then it was worth 10s, and now the same. In the same vill Aelfric of Sandford held 50 acres as a manor. Then as now 2 bordars. Then as now 1 plough in demesne. 1 acre of meadow. 1 horse, 4 head of cattle, 8 pigs, 60 sheep, 7 goats. Then as now worth 10s. In the same vill dwell 8 free men and they hold 1½ carucates and 10 acres of land. And they hold 1 bordar. Then as now 2 ploughs in demesne Then as now worth 12s. William FitzReginald holds all this under William de Warenne. The king has the soke and sake throughout all this land apart from the demesne of Halfdan. And of this land 6 acres of land were taken away from Count Alan which William’s men took away for themselves, as the Hundred testifies. And Thorkil of Wrentham was a man belonging to Eadric, the predecessor of Robert Malet. 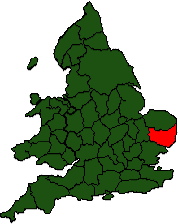 Ranulf his nephew holds Middleton Aelfric, 1 freeman, as 1 manor. Now William de Warenne holds it in this demesne with 2 carucates of land. Then as now 2 villans. Then as now 8 bordars. Then 4 slaves and now 1. Then 2 ploughs in demesne. Now half a plough belonging to the men. 6 acres of meadow. Then 1 horse and now 2. Now 2 cows and 20 pigs and 50 sheep. Then as now it was worth 40s. 1 church with15 acres worth 2s. And to this manor were added 5 free men and half a priest. They hold 55½ acres. 1½ ploughs in this demesne. 2 acres of meadow. It is worth 10s. It is 8 furlongs long and 7 broad, whoever holds land there. And it renders 7½d. And over these 6 free men the king and the earl have the soke and sake. Aelfric, who held this manor, was a man belonging to Eadric, the predecessor of Robert. And William Malet and Robert were seized of this land. Then 5 bordars, now 6. Then 1 slave. Then 2 ploughs in demesne, now 1½ ploughs and half a plough belonging to the men. 1 acre of meadow. Then 1 horse, now 1 ; 8 pigs and 105 sheep. Then it was worth 40s., now 20s. To this manor ware added 100 acres of land which 14 free men held. Then 2 ploughs, now 1 ; 1 acre of meadow. It is worth 10s.William FitzReginald holds this land from William de Warenne. Of these 14 men William’s men have been seized of two half free men against count Alan. Domesday Book, A complete Translation collective work under the direction of Dr Ann Williams, Alecto historical editions Penguin Books 1992.